Brits buy a staggering 3.5 billion sandwiches a year. Despite lots of competition from other grab and go innovations, the humble sandwich continues to weather the storm and maintain its popularity amongst the British public. Today alone, 56% of us Brits will consume sandwiches at some point during the day, with our northern neighbours in Leeds being the top consumers of sandwiches in the UK. Why do us Brits love sandwiches so much? 1. British born and bred. The humble sandwich is quite possibly one of the most iconic British culinary inventions, named after Lord John Montague, the 4th Earl of Sandwich. 2. We care about our sandwiches. We are all a pretty passionate bunch when it comes to sandwich – in our office, we regularly have heated debates over whether it’s a barm or a bap! 3. Marks and Spencers is involved. The packaged sandwich that we often grab for lunch was invented by another great British institution, Marks and Spencers, back in 1980. You really can put anything in them. Although the BLT is a firm favourite amongst the British public, you really can put pretty much anything in a sandwich from cream cheese to chocolate spread. Here at Dunsters we list over 300 different sandwich filler lines – whether you want the more traditional mayonnaise based fillings or marinated meats, there’s something for everyone. 5. You can get them anywhere. Sometimes, it’s hard to find your favourite cuisine but in Britain you will never be far from a sandwich shop – if you’re struggling to find one near you, give us a call and we’ll point you in the direction of one of our lovely customers. 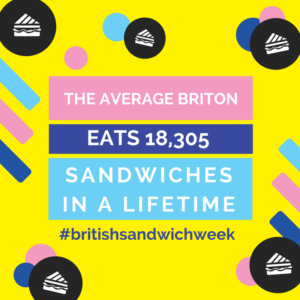 This May, we are celebrating our love for sandwiches by supporting British Sandwich Week from 14 -20th May. During the week, we will be showcasing some of our very own fabulous sandwich fillings plus going behind the scenes at Dunsters Farm to find out our team favourites – will it be a classic BLT or Breakfast barm or will we be surprised by the results?